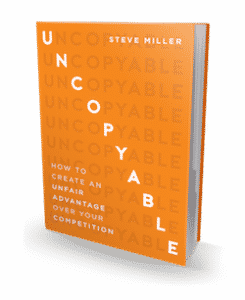 One of the best ways to be UNCOPYABLE in your market is by showing personality. And the best way to do that is through VIDEO. Just look at great examples, like Gary Vaynerchuk, Will It Blend, and the spate of new YouTube superstars, like Simone Giertz (huge fan, Simone!). They all have personality, baby! Unfortunately, many people are uncomfortable on camera. But just because you’re not super effervescent doesn’t mean you can’t be awesome. Just share your personality, baby! Are you getting notice of my weekly UNCOPYABLE Business videos? If not, be sure to sign up here! As always, great helpful tips. Not taking yourself too seriously is so very important, isn’t it? Especially when you’re a Legend In Your Own Mind, like I am, Jim! Just hit the record button – no mirrors – practice!! Thanks, Chris! Yes, that’s right. Hit the record button and start talking as naturally as possible. Tell a story. Make faces. Sing a song. Do stuff that makes you uncomfortable, even though nobody else will see it. If you can’t get comfortable being natural to yourself, you’ll never be natural to anybody else!